We provide total solutions – engineering, procurement, construction, operation and maintenance – for the environmental business filed such as drinking water and sewage treatment equipment, industrial waste water treatment equipment and soil and groundwater purification equipment. We have a lot of experiences as a total engineering and construction of drinking water, sewage and industrial waste water treatment system and do business in Japan and overseas. 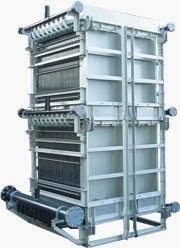 In recent years, we have expanded our overseas sales of submerged membrane bioreactor system (MBR) and seawater reverse osmosis desalination system (RO) that use membrane treatment technology, and we have begun to enter the recycle water business using our systems. The Hitachi Compact MBR (Membrane Bioreactor) is a water treatment system which uses biological treatment in membrane filtration technology. Compared to conventional sludge treatment systems, the Hitachi Compact MBR is more compact and makes it possible to product high-quality treated water. Combining activated sludge treatment and submerged membrane filtration process makes highly concentrated activated sludge treatment possible. Our low-cost system is easy to maintain, save space, and is suitable for small-scale sewage treatment to obtain high quality treated water. There is no need to use a sedimentation tank for the separation of liquids mixed with the activated sludge because the system can maintain the high density activated sludge in the reaction tank. As a result, treated water yields are higher than ever before and saving space and reducing operation costs. Also, with our system there is no need to deal with activated sludge in a sedimentation tank. The Hitachi Compact MBR was jointly developed by Hitachi Plant Technologies, Ltd. and the Japan Sewage Works Agency (Governmental Organization). In addition to the MBR system, we can provide a RO (reverse osmosis) system, thereby providing treated water of still higher quality thanks to the "Hitachi Compact MBR + RO System."